Payment will be done1 week before check in. Open buffet breakfast. Free wi-fi .,city maps for free.Downtown hotel , affordable, and clean.Cafe and fitness center. Piano lounge. Guzel Izmir Hotel has been at your service for the past 65 years.Located in the center of downtown Izmir, right across from Basmane Train station, Metro, and International Fair. If you are looking for affordable clean relaxing room with free continental breakfast and Wi-Fi internet access, and Fitness room and darts we are here to wellcome you with friendly English speaking staff 7/24 open reception. Location Details: Only 100 meters from the historic Basmane-Izmir train station (direct train from the Adnan Menderes Airport you can come by train to Basmane in 20 minutes cost of 2.5-TL), and the Metro and train station is the same place. Once you exit the train station you will simply cross the street and we are on the first street behind September 9 square on the right hand side. Izmir International Fair and and the newly renovated Konak-Pier Shopping center are within walking distance, When you arrive to Izmir Bus Station (Otogar) there are free shuttles from the main bus station to Basmane where the International Fair is. We are located e few meters away from the bus compaines. Hotel is located near bus companies.You can go to Ephesus, Pergamnet , Kusadasi and Cesme easily. 100 m. from the Basmane Train Station and Metro station which takes you to Airport, Ephesus and Virgin Mary Church. Tours Are Also Provide to Ephesus & Mary's House, Pergamum & Asclepium, Pamukkale (Hierapolis), Priene, Miletus & Dydima and Sardis.All you need is to contact with reception clerk. 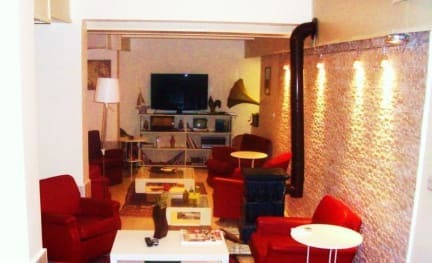 Room Description: Guzel Izmir Oteli offers 30 Air-Conditioned rooms which have mini refrigerator and equipped with satilite TV and Wi-Fi internet access. Rooms have feature city views. These individually decorated and furnished accommodations include double sofa beds. Beds feature triple sheeting and down blankets. Televisions come with premium satellite channels. Bathrooms include bathtubs or showers with handheld showerheads, makeup/shaving mirrors,hair dryer , clean towels and slippers. Business-friendly amenities include desks and phones; free local calls are provided (restrictions may apply). Irons/ironing boards, extra towels/bedding, and wake-up calls can be requested. Housekeeping is provided daily. Wi-fi internet Access is FREE of charge in the house. Guest who does not come with a lap top we offer a PC for FREE. Secure parking is available near the hotel at 10 TL per day.